Have A Blown Power Supply That Needs Repair? Repair Zone Can Help! 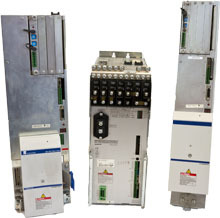 At Repair Zone, we work with Indramat automation components on a daily basis, and power supplies are no exception. We understand how the Indramat automation loop operates in a CNC machine, or other machine applications. And because of this vast exposure and experience we have the ability to load test a variety of Indramat Power Supplies. Our test fixtures have the appropriate drive, servo motor, controller to simulate a machine setting. So, if you are looking for a repair facility that can deliver fast service for your Indramat servo automation equipment without compromising quality workmanship, look no further. Call today 989-922-0043 to receive an expert Repair for any of your Indramat Automation equipment needs! Or, browse our Indramat Power Supply Inventory for repair, exchange, or purchase.